The Raven Boys brought with it a ton of hype, and many, many expectations. I bought my copy several years ago and have made more many attempts to start and finish it than I care to admit. I’ve seen so many people love it, analyze it, re-read it and wait for its sequels that many years ago, I made up my mind to also do that and join the movement. 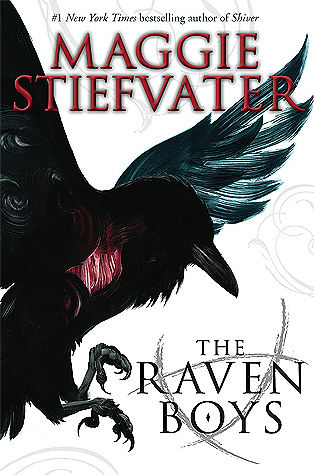 I have never wanted to love a book as much as I have wanted to love The Raven Boys. Reviews of the book warned me that this book would be slow and dreamy. I think I have never been ready for a book that was slow and dreamy. If I wanted slow, I'd go for a fantasy. If I wanted dreamy, I'd go for a contemporary. The Raven Boys is something else altogether, something I have quite yet not been able to identify with or understand, and recognize and get used to the flow of, hence all my failed attempts at finishing the book. If I had to pick a genre, it veered a little too close to magical realism for me, a genre I intensely dislike. But here we are. I have completed the book, and it only took me a couple of days. Admittedly, not a one-sit read, but this is someone who thought she’d never get past chapter five. Stiefvater’s prose is stunning. She is cemented up there with Zusak, with Austen and Montgomery and Orwell as one of my favourite writers. I had an inkling of this, since I follow her on Tumblr, and even the answers to the questions she gets are a delight to read. She has a way with words, a way of spinning up a careful, gentle, atmosphere where you just know that you are on the brink of something wonderful and beautiful. That’s how I felt the whole time I read the book. That’s what kept me going. The dialogue got very frustrating at points though, when I felt like characters were being deliberately mysterious for plot reasons. I dearly hope this won’t continue. Henrietta, where our characters live, doesn’t seem to exist in our time, or anytime. It is home to Blue, the protagonist, and the titular Raven Boys. Gansey. Ronan. Adam. Noah. I fell in love with the boys almost immediately--Ronan and Adam especially. I wish Ronan had been explored in greater detail (though I am told that the sequel does precisely this which makes me happy). Adam’s and Gansey’s dynamic is, I suppose the main relationship that is focussed on. Gansey’s hero complex sort of annoyed me occasionally, as did Noah’s weirdness (though that is explained later). My largest struggle was understanding why Gansey wanted to find Glendower. We are given a weak explanation eventually, but that did not satisfy me. This was problematic, because, well, that’s largely what the book is about. I did not get why he was no invested in Glendower, nor why all the other boys were okay with putting their lives on hold for this quest. Blue is deliberately quirky and refreshingly honest. I enjoyed how sensible and indignant she was and her dynamic with Adam and Gansey was very interesting. I vaguely know where this is headed because furtive Tumblr spoilers but I’m definitely looking forward to watching them continue to interact in the sequel. She has spiky hair and a spiky personality and I simply want to follow her into any book. The Raven Boys is very much a character driven novel. There is a slow, sluggish plot and beautiful, atmospheric writing . But undoubtedly the focus of this novel, the characters are complex and layered and wondrous and you just know, by reading this book, that there is so much left to explore in every relationship. That we are just getting started.